NGO Regavim claims contractor took extra asphalt from Gush Etzion job to make route to illegal Beit Fajjar quarries. 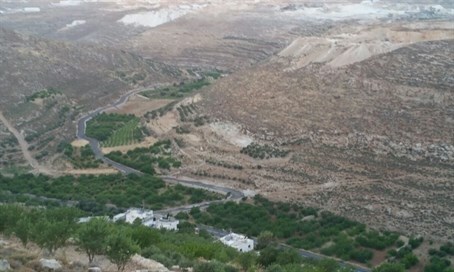 The contractor responsible for repaving access roads in Gush Etzion has reportedly taken the excess asphalt and used it to pave a connection between Wadi Sair and the Beit Fajjar quarries. The quarries are primarily located on land run by the Civil Administration, and their operation has severely damaged the surroundings. The new road serves as a route to smuggle materials from the mines south towards Arab villages, which would greatly assist smugglers trying to evade law enforcement authorities. Regavim, an NGO which focuses on the "responsible, legal, accountable and environmentally friendly use of Israel’s national lands," is trying to raise awareness of the crimes surrounding Beit Fajjar. Last week, the organization sent an urgent letter to Transportation Minister Yisrael Katz (Likud) and the director of the National Roads Company. "Paving the aforementioned path, aside from being a blatant violation of the law that was effectively carried out by a branch of the government, also impedes law enforcement efforts against the quarry, both by allowing the smuggling of materials from the quarry unseen and by creating a quick escape route for criminals," it read. Regavim demanded that Katz and the National Roads Company (NRC) immediately halt the construction work, restore the site to its previous state and carry out a comprehensive investigation into how an illegal road was created under their authorities. "Because this is a violation of the law, perpetrated by a public authority, we will be forced to ask for a police investigation unless it is handled immediately," Regavim added. The National Roads Company has responded by saying that the agreement with the contractor left the excess construction material in his possession. As such, the NRC has no authority over its later use. Instead, concerned citizens should take the issue up as a criminal matter with the Civil Administration.